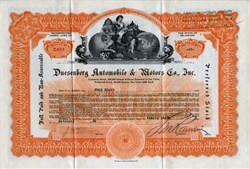 Beautiful SCARCE certificate from Duesenberg Automobile & Motors Company, Inc. issued in 1924. 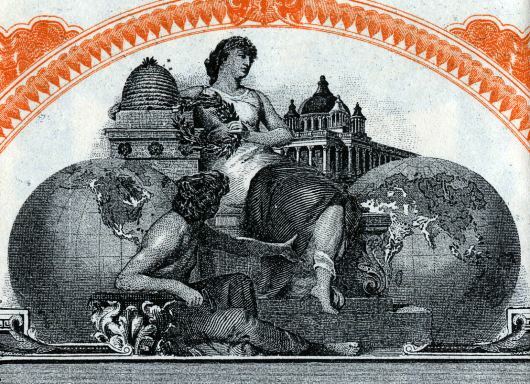 This historic document was printed by the Broun-Green Company and has an ornate border around it with a vignette of an allegorical man and woman next to world globes. This item has the printed signatures of the company�s President and Secretary and is over 85 years old. Duesenberg. The very name evokes luxury, grandeur and the sheer pleasure of motoring. The magnificent Duesenberg automobile of the Twenties and Thirties elevated personal transportation to epic proportions. it was advertised as "The World's Finest Motor Car." and that claim, far from hyperbolic, was satisfyingly true. Everyone knew of the Duesenberg. Car-crazy kids' mouths dropped when a rare Duesenberg rounded a metropolitan corner. Careworn moviegoers of the Great Depression admired "Duesies" on the screen. Yearning car shoppers of modest means couldn't resist an occasional outing to a Duesenberg sales showroom, just to fantasize about owning one. The reputation of the unparalleled Duesenberg was founded on a brilliant racing heritage. Duesenberg was the first American car to win the famous Grand Prix at Le Mans, France, in 1921. Driven by Jimmy Murphy, the car established a new road record by outdistancing the entire field by fourteen minutes. Other Duesenbergs won Indianapolis 500 races three times in the 1920's. These successes were the rewards of brothers Fred Duesenberg (1876-1932) and August Duesenberg (1879-1955), two native talents and mechanical masterminds who taught themselves the principles of transportation engineering. Born in Germany and raised among the large Duesenberg family that had emigrated to Iowa, the boys found favor in building and racing bicycles. Their own bicycle shop evolved into a career of constructing and piloting racing cars. After a period of government service, building World War I aviation and marine engines in New Jersey, the brothers came to Indianapolis, where the Duesenberg Automobile and Motors Company was established in 1920. Production soon began on Duesenberg's first passenger car, the Model A, a costly prestige car. The expensive Model A, though it pioneered the use of straight eight-cylinder engines and four-wheel hydraulic brakes, had disappointing sales and was discontinued in 1926. In the fall of that year, transportation industrialist E.L. Cord, president of the Auburn Automobile Company, purchased Duesenberg, with a vision of making luxury cars on a larger program. In October, 1926, E.L. Cord told the Indianapolis Star, "The purchase of the Duesenberg factory is the culmination of my plans to be able to offer the world an automobile of undisputed rank. In fact, the finest thing on four wheels. Duesenberg cars will be strictly custom built, the owners selecting their own body styles, their own body makers and selecting their own colors. The price probably will be $18,000, no matter what model, from racer to limousine. We will give the buyer 120 mile-an-hour speed if desired. Naturally, the production of this type of automobile, which carries a warranty of fifteen years, will be limited and we are now taking orders..."
E.L. Cord commissioned Fred Duesenberg, newly installed as vice-president of engineering, to develop the ultimate motorcar that would outclass all other American makes. The result was the unsurpassed Model J, introduced at the New York Automobile Salon for the 1929 model year. Its brutish Lycoming straight eight engine, developing 265 horsepower (the next largest car on the market was the Pierce-Arrow, with a horsepower of 125),.attained speeds exceeding 115 miles per hour. By 1932, supercharged engines of 320 horsepower were part of the line. Duesenberg manufactured the chassis, engine, grille and front sheet metal. The cost of the Duesenberg product was $8,500. Custom bodies were supplied by the most illustrious coach builders around the world, bringing the total price to a range of $15,000 - $18,000. 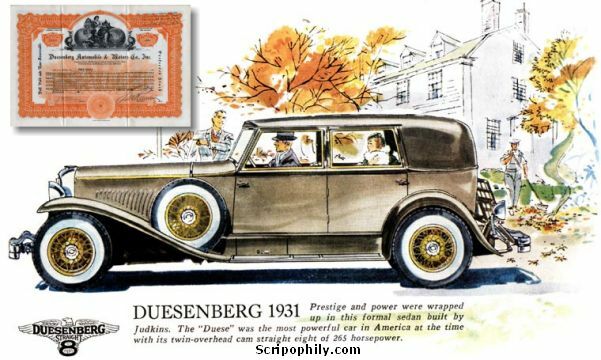 Duesenbergs' became the favorites of movie stars, monarchs and millionaires. 481 Model J's were made between 1929 and 1937, when Duesenberg, Inc., a subsidiary of the gigantic Cord Corporation, was sold and dissolved. Today the cars are worshiped by historians and prized by collectors, who pay prices beyond one million dollars. More than 75% of all Duesenberg still exist today. 55% are still operable.